Mrs. Jenelle Codianne began her improbable study of jujitsu in 2011 at the Jukido Academy in Palm Coast, Florida. With little to no interest in studying martial arts she took part in the dojo’s free trial only to accompany her cousin who was interested in exploring the world of self-defense. She liked what she learned enough to sign up after the trial program expired. Before long, she had fallen in love with the art of Jukido Jujitsu. An improbable attendee of a trial class within a few short years had became not only among the most gifted practitioners in the dojo but also one of the holders of the coveted black belt. A special blend of discipline, dedication, intensity, and talent has made her an inspiration to women and men who are also on the Jukido journey. 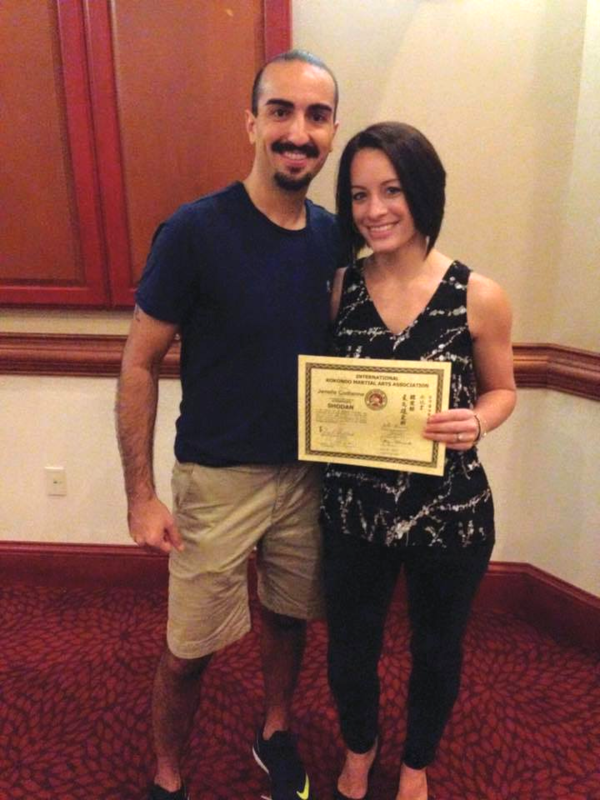 Mrs. Codianne is among the most consistent and active members of the Jukido Jujitsu Academy. In addition to several weekly training sessions she has benefited from regularly attendance to advanced training seminars regionally and nationally. She also advances her training through ongoing black belt classes and private instruction with her sensei, Master George Rego. She has become a featured part of public jujitsu self-defense demonstrations put forward by the Jukido Academy, highlighting the unique capability of a small, yet well trained, woman to defend herself against men who are twice her size. Along with 3 other dojo members (Ms. Karina Kuchta, Ms. Kayla Dance, and Mr. David Petkovsek), Mrs. Codianne underwent the infamous Jukido Academy 6-part black belt examination over a series of months. The test is designed to thoroughly examine the quality of technique, spirit, and knowledge of the individual being evaluated for the coveted black belt as recognized by the Master Rego, the Jukido Academy, and the International Kokondo Association (IKA). The process includes a written essay, and separate examinations on core self-defense, throwing techniques, random self-defense, kata, randori (sparring), multiple attackers, and more. At the 2015 IKA National Seminar she was tested and promoted to the probationary rank of shoran or 1st degree black belt. After a year of training with full commitment and striving toward constant progress, she was tested at the 2016 IKA National Seminar. She was successful was elevated from probationary status to a full recognized permanent black belt in the art of Jukido Jujitsu. Her incredible journey was documented by local media (Ormond Beach Observer: The Director of Marketing at MOAS Could Literally Throw You!). Her path to black belt has been among the fasted in the history of Jukido Jujitsu in Florida. There have been no shortcuts, only focused and total commitment to achieving her goals. Jenelle Codianne is intense, loyal, and well known for the execution of her favorite branch of techniques — Nage-Waza (throwing techniques). Her speed combined with fluidity create throwing techniques that are both devastating to receive and beautiful to observe. Her journey toward mastery continues as she applies herself toward advanced rank of black belt in the Jukido system of self-defense oriented jujitsu. She has and continues to play a leadership role in branch programs of the Jukido Academy, including: Active Shooter Survival, Self-Defense Essentials, and Women’s Self-Defense. Outside of martial arts, Mrs. Codianne happily married and is an accomplished professional. She was featured in the “40 Under 40” which recognizes ambitious and successful young professionals. She is the Director of Marketing & Public Relations at the prestigious Museum of Arts & Sciences in Daytona Beach, Florida.